I just returned home from a very enjoyable lunch at Ingleside Village Pizza. 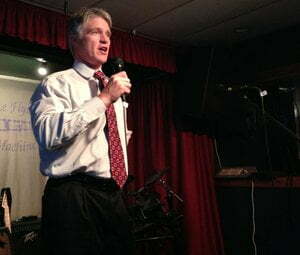 The lunch included several supporters in addition to Andrew Hunt and some very good pizza. We were also joined by a Channel 11 news reporter from Atlanta but unfortunately no local media from here in Macon covered this lunch. I spent around two hours at this restaurant engaged in a very lively but always amicable discussion with people that described themselves from conservative, liberal, republican, democrat and independent. I think the libertarian party is gaining traction because it can appeal to a wide range of political views. No two people will agree on all issues, but I despise the way talking heads on TV and radio do their best to only focus on areas that divide and not unite us as a state and country. Mr. Hunt was asked a variety of questions on all manner of topics and was never afraid to shy away and give honest and well-reasoned solutions and opinions. His answers seemed to be representative of a new breed of libertarianism that I like to call Pragmatic Libertarians. Ron Paul appealed to a wide range of people but there was always one or two positions that seemed to alienate voters as too extreme. He also just got flustered too easily. His son Rand seems to have learned that lesson well and is not repeating those mistakes. I am a proud independent and quite frankly wish political parties would be banned outright. I think they do far more harm than good when members of a party are pressured to vote party line instead of their conscience. Politicians are threatened if they fail to vote the way the party whip wants them to vote. Their political careers are basically over and they will never serve on any committee of importance if they dare to vote against party line even though they should. For all my fellow House of Cards fans out there I am sure you understand this concept very well. This essentially says to the voter that their votes are worthless since once they head off to Atlanta or D.C. the party elders will tell them how to vote and they no longer need to concern themselves with their promises or the voters that brung them to the dance. I also enjoyed the great discussion I had with many of the supporters I met. They were extremely articulate and had many interesting stories that they shared. I hope I convinced a few of them to contribute to this blog since I think more people need to hear their stories. There is no reason why we must continue to be spoon fed pablum from the media when so many intelligent people in the community have so much to contribute to the political dialogue. The time for apathy is over if we hope to effect any legitimate change. The biggest obstacle any third party candidate faces is the inevitable reluctance people feel that they will throw away their vote on a third party. Andrew Hunt responded to this by saying that first and foremost your vote would not be wasted since Georgia will have a run-off election. This is extremely important because it means you can vote for the person you support as opposed to the lesser of two evils without fear your vote is wasted. I share this view that voting is more than a right it is a privilege. Are we not wasting our votes when we cast them against our own conscience? Are we not throwing away our votes when we have to hold our nose while we cast our ballot? Aren’t we just creating a self-fulfilling prophecy by simply dismissing an independent or libertarian candidate even though they are our ideal candidate on nearly all the issues that matter to us. Also equally important the big two political parties have a virtual stranglehold on all local elections. gerrymandered districts are simply one tool the parties use to maintain the status quo. A Gubernatorial candidate that receives 20% of the votes in an election would open the door to more independent candidates at the local level running for office. So no, a vote for Andrew Hunt will not be wasted since it is very likely we will have a run-off so you can vote with conviction and no regret. I left my two hour lunch with mixed feelings. On the one hand I am sure that Andrew Hunt would make an excellent governor and begin the long and arduous task of repairing the mess that Nathan Deal has created. On the other hand I wonder whether enough voters in Georgia will bother to research the issues and candidates and actually cast a vote based on due diligence as opposed to simply choosing to vote all R or all D as so many tend to do like blind lemmings. Andrew Hunt has a difficult job ahead of him educating the voters in this state that there is a viable alternative. For the good of our state I certainly wish him the best of luck and will do my best with this blog to let people understand why it is so important than Nathan Deal is sent packing. For those of you that still think Nathan “Raw” Deal has been a good governor I suggest you look at the list below. Hunt is already polling at over 9% which is extraordinary and similar to where Jesse Ventura was at this time in Minnesota and I can see his numbers vastly improve once people familiarize themselves with him and watch the debates. Georgia ranks 50th in the country as far as corruption in a state integrity report card. Georgia ranking #1 in Business was a scam bought and paid for by a $44 Million tax break to Caterpillar. They turned around and formed a group that then named Georgia #1 for business which is the least they could do for that $44 million gift from Nathan Deal. Georgia has three cities among the 10 fastest shrinking cities in the U.S. Georgia is the only state with more than one city on that list. Valdosta, Albany and Macon are all on the Bloomberg Rankings. Georgia’s per capita income has dropped to 40th in the country and only one other state can claim that in the entire country. Georgia is 32nd in both CNBC’s quality-of-life and education categories. Georgia 48th in the country when it comes to children being covered by health insurance. 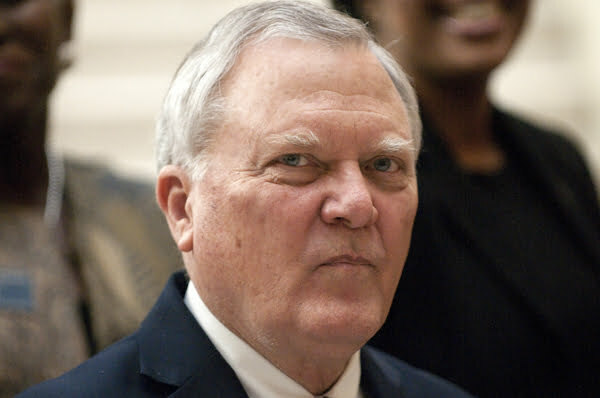 Nathan Deal Voted among worst Governors and also in 2009 worst congressman in the country. The FBI has an ongoing investigation into Nathan Deal. Is he the next McDonnel? The next time someone that supports Deal brings up that #1 in business claptrap be sure and send them to this page and ask them their thoughts on the rankings that matter to Georgians who aren’t CEO’s.